Nourish your body as you indulge in Love Fed desserts--heaven in every bite. In Love Fed: Purely Decadent, Simply Raw, Plant-Based Desserts, Christina, founder of the vegan dessert line PatisseRaw and the popular blog love-fed.com, serves up raw, vegan treats full of nourishing ingredients and intense flavor, without a touch of gluten, dairy, or refined sweeteners. 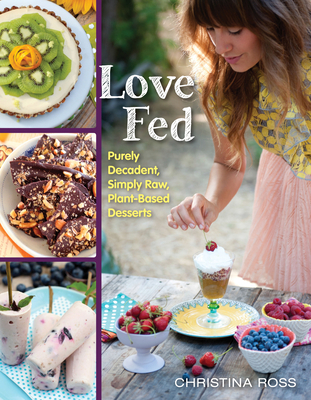 Love Fed takes the plant-based, no-cook method of preparing desserts to new heights with more than 80 delicious, easy recipes. Christina gives you everything from Pistachio Saffron Rose Water Ice Cream and Chocolate Almond Hazelnut Caramel Apple Torte to Trail-Blazing Truffles, Blueberry Coconut Dreamsicles, and Splendid Day Red Velvet Cupcakes, satisfying to even the most discerning sweet tooth. Along the way, she introduces new ingredients, shares her solutions for potential hiccups, tells stories from her life, and includes mouthwatering full-color photos. Featuring a recipe by Jason Mraz, Love Fed caters to both novices and experienced foodies alike. Chocolate lovers, caramel aficionados, ice cream devotees, cake enthusiasts, cheesecake fans--Love Fed has it all for you. Christina Ross is an Ambassador of Healthy Living, a dynamic conscious recipe and product creator, educator of vitality through the art of eating and living vibrantly, a freelance writer and blogger. She is the founder of PatisseRaw, a transitional raw and vegan dessert line sold online and locally in Southern California. PatisseRaw has attracted a health-conscious celebrity following and has also been featured on NBC's Today show. Christina's recipes and healthful lifestyle tips have been published in Natural Child World Magazine through her column "Love-Fed." Christina also contributes recipes and articles to popular sites and works such as RawfoodRecipes.com, Clean Food Living, Vegan Food Share, Organic Soul, Sheknows.com, Just Eat Real Food, RawGuru.com, and Kris Carr's MyCrazySexyLife.com. Christina keeps her many fans full of nutrient rich content through her blog Love-Fed.com and through television appearances, which have taken her to Chicago's Good Day Chicago, as well as San Diego Living.